Wedding Letter Hire are proud to add sparkle by lighting the way at our clients weddings. We were thrilled to hear that unusual and unique lighting was a big trend this year. Our letter lights have proved to be really popular with our brides and we’ve also provided letters and words for some large companies and famous names too – such as model Kelly Brook! Lighting is a great way to add atmosphere to your big day whatever your venue setting or theme. We know that our illuminated letters can add shine anywhere they go and here’s why we think that creative lighting really is the future of wedding styling. The key thing for weddings in 2015 is to make them unique. Every couple has their own personality and style and you want to reflect that in your big day. So, whether you are having a quirky festival themed event or a more traditional do at a stately home then our large light up letters are the ideal accessory. As well as having words such as LOVE or DANCE you can really personalise your special day by choosing yours and your partners initials to shine in lights. You could even create your newly married name and have MR & MRS SMITH placed behind the top table lighting the way as you come out of your ceremony! 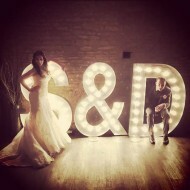 Brides tell us that their guests are always wowed by our giant letter lights and they make a great talking point. Not only are our illuminated letter lights an amazing feature but lights are the latest on trend prop for wedding and engagement shoots too. Every good photographer knows that the difference between a good picture and a great picture can be the lighting. You can be as creative as you like with your photos and as our letters are all 5ft high they look amazing lighting the way in your pictures. We’ve even seen photos where the whole party were sitting in and on the letters! Our letters look really striking at night too and make a really atmospheric setting for your evening pictures. There’s really no limit to the way that you can use light as a striking feature to your wedding. As well as using our gorgeous letter lights you could also consider adding atmosphere with other styles of lighting too. Tea lights are always a pretty addition to tables at the wedding breakfast and look lovely for a vintage summer theme. You could even place them along the path to your venue to light your guest’s way. Or how about using silver lanterns grouped together gently flickering in the evening to create a romantic ambience to your event? Our fairground letter lights can even go outside so you can use them in the grounds of your venue or in a marquee. At Wedding Letter Hire we just love lighting the way for you and all your guests at your big day. Why not take a look at our photo gallery to see how amazing our lights can look.